Place the flour, salt, yeast, Wharfe Valley Garlic and Rosemary Rapeseed Oil and 300ml of water into a large bowl. Gently stir the ingredients to form a dough and then knead the dough in the bowl for 5 minutes, gradually adding the remaining water. Stretch the dough by hand for five minutes. Tip the dough out on to an oiled work surface and knead for a further five minutes. Return the dough to the bowl, cover, place in a warm room and leave until the mixture doubles in size. Line two large baking sheets with greaseproof paper. Tip the dough out of the bowl, knock back and then divide into two portions. Spread each portion out on the baking sheets, ensuring it stretches to the corners, then leave to prove for an hour. Rapeseed Oil, sprinkle with fine sea salt and bake in the over for 20 minutes. 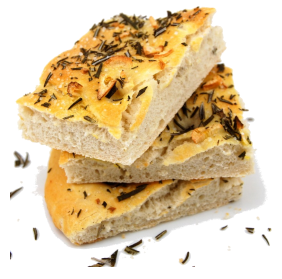 When baked, drizzle with a little more Wharfe Valley Garlic and Rosemary Rapeseed Oil.